Surrender of Sovereignty: Guardian Angels: Beautiful Comfort Or Stinky Doctrine? Guardian Angels: Beautiful Comfort Or Stinky Doctrine? 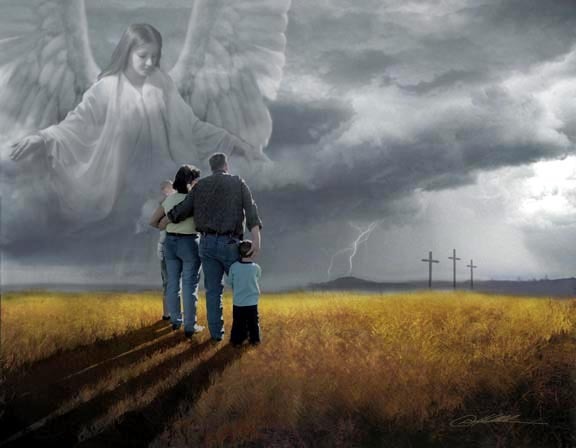 Guardian angels, where are you when dozens of children are killed by tornados and floods? Where are you when parents pray for their children, yet they are murdered at school? Where are you when folks are in a large group and having fun at a movie, yet a gunman comes in with guns blazing and kills indiscriminately? Where are you when our children are killed in accidents on the way to or from school. Where are you when child molesters destroy our children's innocence? Where are you when a mudslide drowns a whole town: men women and children? Do you turn away for some greater reason and withhold your protection? Or is it possible your protection is a myth or you do not even exist? I think you exist in the imaginations of men and women who want to believe in something. In fact, I think we are not protected by any unseen spiritual force. I think there is no god orchestrating the events we face in this life. If we live in "tornado ally," we may be involved in a tornado. If we hurtle ourselves down the highways in vehicles, we could have an accident. Those who believe in guardian angels make excuses for why tragedies happen to innocent children. 1. They use the story of Job and his children to prove their point. It seems that Job's children were at the oldest brothers house for some kind of a party. There were varying reports that reached Job, but essentially his children were killed by a tornado, and his livestock and herdsmen were attacked and killed both by invaders and lightning. Here, allegedly, is Job's reply: "God gives, God takes. God's name be ever blessed." 2. Children have angels according to Matthew 8:10. "Take heed that ye despise not one of these little ones; for I say unto you, That in heaven their angels do always behold the face of my Father which is in heaven." 3. Pslams 91:11 says: "For he shall give his angels charge over thee, to keep thee in all thy ways." The Christian is called to believe unimaginable foolishness. The Bible teaches that God keeps a believer in all their ways, yet when they are not kept in all their ways they are admonished to take Job's attitude and consider it a test of faith, uttering no bitterness or blame toward the one who is supposed to be protecting them when all hell breaks loose. The Bible holds so many opposing, ambiguous, and ridiculous models for our behavior that only one who practices blind, unquestioning faith can navigate it's foul waters. It's like that advertisement we see on television where they put an air freshener in a foul and stinky room and then ask blindfolded people how the room smells. They always respond how good and fresh it smells. The Bible has enough encouraging promises and teachings that a believer can ignore the stink of the book and just concentrate on the parts that are loving, wise and encouraging. When the blindfold is allowed to fall off, the revelation which follows can be life changing. We can't fix something until we identify the problem. And when we realize that no unseen guardian angel is going to make our way smooth and protect us from harm, we can participate in life with a new and invigorating responsibility for our lives and actions. We can experience the freedom of charting our own course and making our own decisions. I questioned the Bible, and I am so fortunate to have had the strength to let the blindfold of wishful thinking fall from my eyes. Order your copy of Surrender of Soveignty today and see how it is possible to reclaim the sovereignty of your life.